WASHINGTON—After months of uncertainty, Chen Guangcheng, a blind human rights lawyer who last year sought refuge in the United States, has secured three positions with U.S. academic, advocacy, and policy institutions, giving him a sturdy platform from which to continue his activism on human rights and democracy in China. The announcement was made at the National Press Club on Oct. 2 by the three organizations that have become affiliated with him: the Catholic University of America, the Witherspoon Institute, a conservative think tank in New Jersey, and the Lantos Foundation for Human Rights and Justice, based in New Hampshire. His sponsors declined to discuss the financial arrangements. 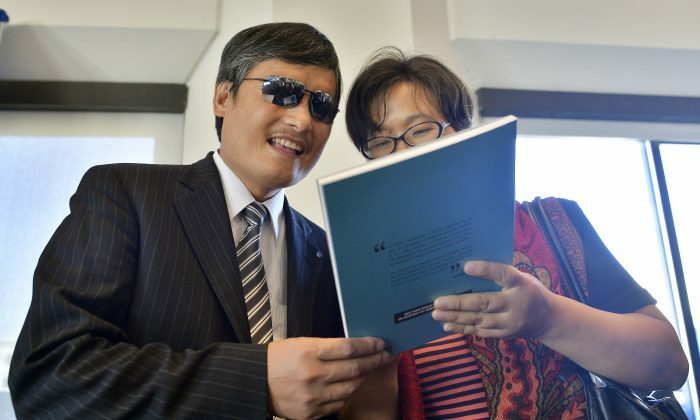 In April 2012 Chen Guangcheng escaped from his rural home, which was under strict lockdown, and made his way to the U.S. Embassy in Beijing. The negotiations between Chinese authorities and the U.S. State Department were extremely tense according to all accounts, and resulted in Chen’s taking up a position at New York University the following month. That relationship ended in acrimony last June, with Chen saying that the university had come under pressure from the Chinese Communist Party to expel him. In response to a question, Chen also remarked: “I feel everyone should be vigilant to the threat the Chinese Communist Party poses to the free world… not only posed to academia but also to other parts of society.” He maintained that NYU had come under pressure. After Chen’s public split from NYU, Jerome A. Cohen, a Chinese legal specialist and a professor at the university who helped broker Chen’s stay there, suggested that Chen had come under the influence of conservative political interests in the United States. An offer that Chen had received to take up a position at the Fordham Law School was subsequently withdrawn. John Garvey, the president of Catholic University, said that the institutions that now support Chen “don’t really fit some ready description.” The Catholic University is nonpartisan, and the Lantos Foundation was founded by democratic congressman Tom Lantos, Garvey said. Chen did not make clear precisely what sort of work he would be engaged in at his new positions. He will be a Distinguished Visiting Fellow at Catholic University, a Distinguished Senior Fellow in Human Rights at the Witherspoon Institute, and a Senior Distinguished Advisor at the Lantos Foundation.